“Tsotsi” is a South African movie directed by Gavin Wood. It won an Oscar for Best Foreign Film. But a lot of the buzz surrounding the film was regarding how well it was received in South Africa. “Tsotsi” received standing ovations and cheering at international film festivals — and at home — generating a lot of pride in the country’s fledgling film industry. It also reflects the country’s post-apartheid potential, struggles, dilemmas and frustrations. Based on a book by South African playwright Athol Fugard, “Tsotsi” refers to a nickname that means “hooligan” or “thug” in Soweto slang. 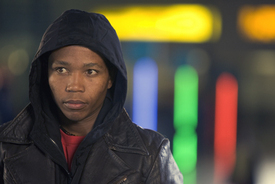 Tsotsi, played by Presley Chweneyagae, runs a little up-and-coming gang. We meet them while they’re committing a murder on the Johannesburg subway. It’s cold and chilling. The film turns on another crime — a carjacking. Tsotsi hijacks a car and shoots the woman driver. He doesn’t know there’s a baby in the back seat. The rest of the film looks at what he does with the baby boy (and symbolically, the future). Tsotsi walks from Soweto, with poor people’s shacks and smoke rising from wood fires, to Johannesburg with its bright lights – big city skyscrapered wealth. To get there he has to cross a ravine — the great divide. Tsotsi seeks out a neighbor, a widowed mom, for help with the baby. Her husband was murdered by a tsotsi on his way home from work. She sets the stage for the question: can Tsotsi redeem himself? Tsotsi’s childhood was a hardscrabble life. His mother died of AIDS. His father, authoritarian and semi-thuggish, runs Tsotsi off. He seeks shelter in a giant sewer pipe placed in a ravine, but not in use for Soweto. Then the film shocks you. The pipe is really a two-story shelter full of children. Is this a public housing project for AIDS orphans? Is this the best South Africa has to offer? Will they become like Tsotsi? Much of the beauty of “Tsotsi” is in the faces of “the wounded” we are watching. Like the billboard and great divide, Tsotsi’s gang is part of the morality play. Bottles is an alcoholic who is savagely beaten by Tsotsi for confronting him about what decency is in response to murder. He is just shy of graduating school. He could have been a teacher in the new South Africa. Santi Suthinithet contributed to this article.